Las Vegas, CES 2013 – January 4th, 2013 – The leading hardware solution provider, Rosewill®, will be show casing their latest innovations and premiere line of products at CES 2013. 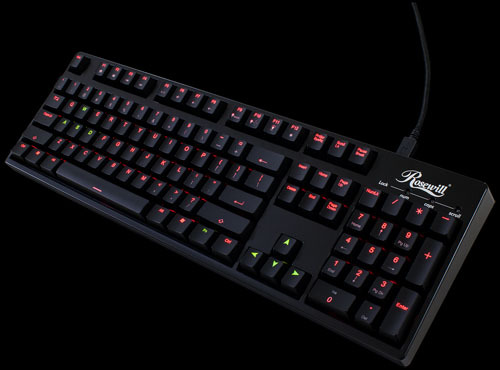 Rosewill® will debut a world first, Rosewill® Helios RK-9200 Dual LED Backlit Mechanical Gaming Keyboard with Cherry MX Switches in Blue, Red, Brown, and Black. It supports Red or Green Backlit LEDs and allows independent color control of the vital WASD and 4 directional arrow gaming keys while allowing you to choose between 5 global brightness modes. It will stand side by side with the RK-9000 and RK-9100 series Mechanical Keyboards that have already cemented their positions. Rosewill® will also be show casing their line of Computer Cases, Power Supplies, Networking products, Server products, Gaming Peripherals, Surveillance Products, and Computer Accessories that compliment your PC build. Rosewill® will launch a new gaming case, THRONE, in Black and White, with its sleek angular appeal and aggressive appearance; it’s the case to have for any gaming event. Alongside will be the newly introduced ARMOR Evolution mid tower case, the first mid tower with support for E-ATX motherboards and have 2x USB 3.0 front ports. To power your system, Rosewill will have on display a full line of award winning 80 Plus Platinum Power Supplies with up to 1600W of power. New Server products will also be making their debut with the new 5 and 8 Bay RAID Enclosures with USB 3.0. Alongside Rosewill’s IT products, on display will be a diverse product line of consumer electronics that will not disappoint. Exclusively at Rosewill’s Suite; on display will be a PC built for its gaming prowess around the Rosewill THRONE gaming case, powered by a HERCULES 1600W power supply, Intel Core i7-3970x Processor, 3-way SLI NVIDIA GTX680 graphic cards, and other high-end computer components; it’s an ultimate gaming system for any gamer. Rosewill Inc. (www.rosewill.com<http://www.rosewill.com/>) is the leading manufacturer of a vast array of computer hardware, peripherals, consumer electronics, mobile hardware and accessories. Established in 2004, Rosewill brings high quality hardware at affordable prices. Formed from a top team of hardware professionals, Rosewill is dedicated to its mission to compete and succeed on price, quality, and service. Our vision is to become the leading brand in computer hardware and peripherals through integrity, innovative products, and superior customer service.